Revenue in the Connected Car segment amounts to US$6,788m in 2019. Revenue is expected to show an annual growth rate (CAGR 2019-2023) of 8.3%, resulting in a market volume of US$9,347m by 2023. 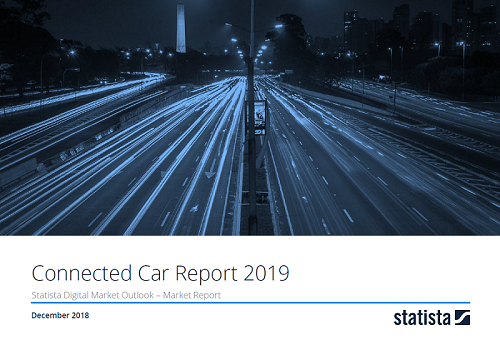 The Connected Car penetration is 0 in 2019 and is expected to hit 0 by 2023. The market's largest segment is Connected Hardware with a market volume of US$6,424m in 2019. In global comparison, most revenue is generated in United States (US$6,968m in 2019). The Connected Car market includes the one-time purchase of hardware which enables vehicles to network in various ways, as well as regularly collected fees for various services. A car is considered "connected" as soon as it is equipped with hardware which enables internet connection, thus creating the basis for communication of the vehicle with other connected cars, smartphones, and the environment. The hardware ranges from simple telematics for gathering, sending, and receiving limited amounts of data to products that enable extended use of internet connectivity and infotainment offers. Not included are B2B services (e.g. telematics for fleet management), commercial vehicles and solutions that allow subsequent networking. Reading Support Revenue in the Connected Car segment amounts to US$6,788m in 2019. Reading Support The Connected Car segment is expected to show a revenue growth of 12.7% in 2020. Reading Support In the Connected Car segment, the number of existing Connected Cars is expected to amount to 109.9m by 2023. Reading Support The average revenue per Connected Car in the Connected Car amounts to US$137.14 in 2019. Reading Support With a market volume of US$6,968m in 2019, most revenue is generated in United States. Reading Support With a rate of 39.3%, the user penetration in the Connected Car segment is highest in United States. Here you can find more studies and statistics about "Connected Car".